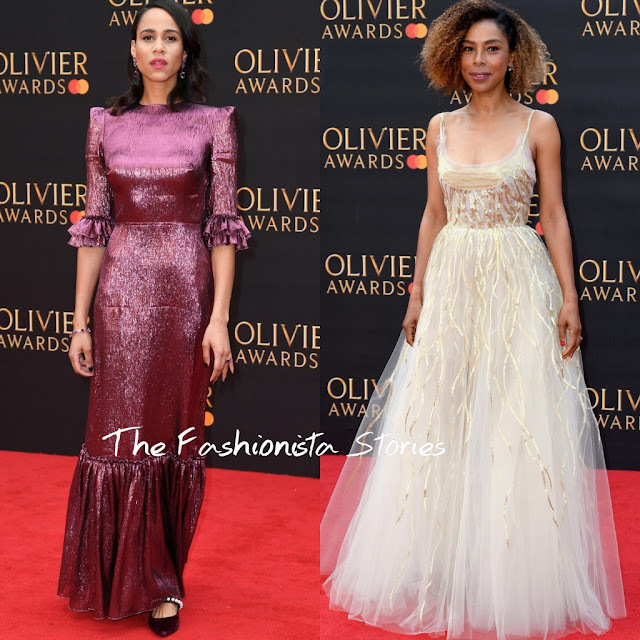 The 2019 Olivier Awards with Mastercard, took place at the Royal Albert Hall yesterday(April 7th) in London, England. Gillian Anderson, who made an rare red carpet appearance, wore a GIORGIO ARMANI PRIVE FALL 2018 black velvet & semi-sheer beaded gown. Those spaghetti straps are bothering me, it should have been removed. A red JIMMY CHOO clutch rounded out her look. Katharine McPhee was the standout here wearing a bold ELIE SAAB off-the-shoulder, lace panel pleated gown, which she accessorized with STEPHEN WEBSTER jewelry. A matching lip color rounded out her look. Zawe Ashton wore a THE VAMPIRE'S WIFE dress, which we have seen on the carpet on many occasions, and in various hues. Nonetheless, she looked great. She finished up with MOTHER OF PEARL flats and a complimentary beauty look. Sophie Okonedo wore a OSCAR DE LA RENTA PRE-FALL 2019 white tulle and gold sequin gown. Love her natural hair but I kinda wish she wore it in a pinned up-do, like a bun. She is beautiful nonetheless.